Soft & buttery, vanilla & almond-infused thumbprint cookies rolled in slivered almonds, filled with raspberry preserves, and drizzled with melted white chocolate! 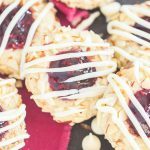 These White Chocolate Raspberry Almond Thumbprint Cookies are irresistible! In a small microwave-safe bowl, heat the jam for 30 seconds, or until thin and liquidy. Spoon about a teaspoonful of jam into the center of each thumbprint. Drizzle melted white chocolate over thumbprints. Allow to set. Store in airtight containers.